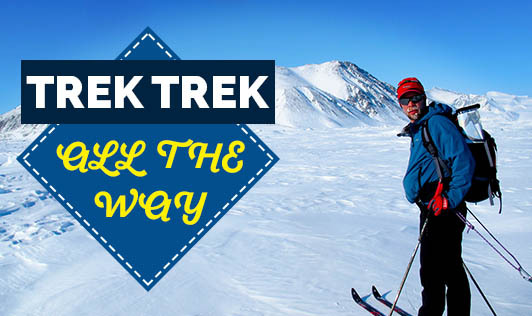 Trek trek all the way! An adventure trek would be something you will enjoy provided you are well prepared in terms of your safety and health. Here are a few tips and guidelines that would help you be well prepared for an adventurous and unforgettable trekking experience. • Have a medical fitness check up done before planning a trek. Take precautions against diseases like cholera, malaria, typhoid, tetanus and hepatitis. • A study about the climatic conditions of the place is the first and foremost thing to be done. Do not trek in bad wheather. Carrying a rain coat or windshield would be a good idea as the climate may change frequently in most trekking points. • Carry a bag that is spacious with multiple pockets engrafted with zipper closure and cushioned shoulder straps so that all the essential trekking equipments can be carried. • A few things you must have are a first aid box, a Swiss army knife, a lighter, a flashlight, water bottle, a direction compass, topographicalmap, space blanket and winter attire. Carry a trekking rope of 50mts with you and a sleeping bag. If it's an icy terrain, an ice cutting axe is a must to carry. • Wear a full - sleeved shirt and full pants to avoid insect bites. • Wear proper trekking shoes.Your trekking shoes should be half size bigger than your regular shoes to accommodate for the swelling and for heavy trekking socks. • Always cover your neck area, as the frequently changing wheather may lead to serious neck problems. • Apply a sunscreen with a higher SPF. • A carefully controlled and monitored diet on the mountain is essential. A carbohydrate rich and high liquid diet with fresh ingredients is what you will need to sustain yourself through the trek. • Carrying an Aspirin and Paracetamolis highly recommended for headaches as they thin the blood and improve circulation & oxygen delivery to the body. Avoid strong painkillers as as they can suppress respiration. Talk to your doctor before taking any medications. • Drink atleast 3-4 liters of water to avoid dehydration. • High altitudes may affect your menstrual cycle, so carry appropriate materials. • Use toilets wherever possible to avoid spoiling the campsites. • Please carry downall garbage and plastic to avoid spoiling the campsite. • Protect your cameras, whether video or film, against cold either in a warm pouch or the interior pockets of your clothing. Do not keep your camera in your backpack at higher elevations. • Avoid waterfalls during monsoon, especially the ones which are at a great height, as rocks keep falling due to rain, and the terrain may be too slippery. • Early-morning starts are the best bet for any hike, both for avoiding the afternoon sun and to allow extra time in case you are forced to take shelter from the weather. • Take smaller steps on rocky patchesand lean forward as the pitch gets steeper. Taking large, fast steps up an ascending rock face can strain your calf and Achilles tendon. These are a few precautions and tips you can remember while planning your trek, so you can avoid a few emergencies through your journey.